This authentic half-timbered house from 1900 was built on the foundations of the farmhouses that had been there from the 16th century. In the 1970s, the house was inhabited by a potter who worked and lived here with his family. His handmade tiles can still be admired in the kitchen, as well as other places. This house has been renovated and modernised with much love and dedication and with respect for the authentic details and the surroundings. This has led to a comfortable house in a picturesque village, set in a breathtaking landscape. Perfect for a holiday or a short break from your daily routine. The house is located just 10 minutes from the Belgian border. Trier, Maastricht, Aachen and Cologne can all be reached by car within an hour. Many little towns and villages, such as Monschau and Bad Munstereifel, are only half an hour away. The village is right next to a protected natural area. The immediate vicinity is the perfect place for hikers, mountain bikers, motorbike travellers, nature and wildlife enthusiasts and those seeking peace and quiet. You can also visit some impressive castles in the neighbouring towns of Reiferscheid and Wildenburg. 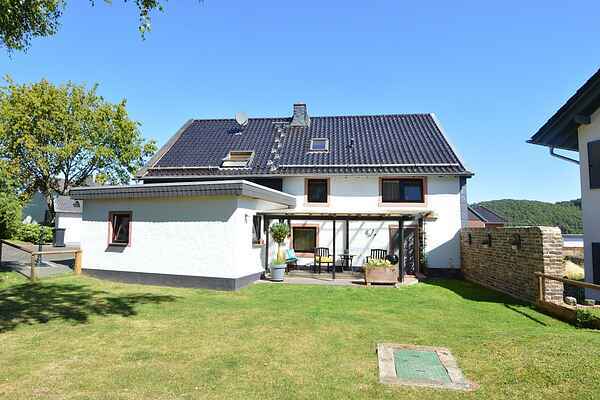 This holiday home is ideal for families and families who want to enjoy a wonderful and relaxing holiday in the beautiful Eifel. The village Sieberath is a little remote and makes it an ideal base for rest, hiking and nature lovers. Shops, supermarkets and restaurants can be found in the nearby towns of Hellenthal, Blumenthal and Schleiden. All about 10 - 15 minutes by car. On the other side of the street about 100 meters away and in the village is a nice goat cheese factory (Ziegenkäse) located. There are also residents who keep bees and regularly sell fresh honey at home. The house has three bedrooms, two with a comfortable double bed. The third bedroom has 2 single beds that can be extended to 2x a double bed. This makes the house ideal for 6 people and possibly suitable for a maximum of 8. With an occupancy of 8, 4 guests sleep in 2 double beds in one room.